Kia has announced pricing and specifications for its e-Niro SUV (see road test here), which goes on sale in April as the brand’s second global electric vehicle. Priced from £32,995 after the Plug-in Car Grant and bringing a revised WLTP range of 282 miles – down from the previously quoted 301 miles due to overestimations on the WLTP cycle, as with sister model the Hyundai Kona Electric – the e-Niro will be distinguished from the Hybrid and PHEV models through bespoke styling features, including revised front and rear ends and new 17-inch aluminium alloy wheels plus a unique interior. 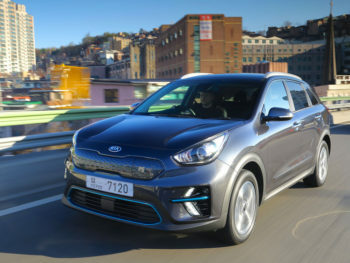 Although a 39kWh battery model is available in other markets, the UK will just get the 64kWh model, which is paired with a 201bhp (150kW) motor, producing 395Nm of torque, enabling the Kia e-Niro to accelerate from 0 to 60mph in 7.5 seconds. Like the Niro Hybrid and Plug-in Hybrid variants, the new electric model is front-wheel drive. Recharging to 80% capacity takes 54 minutes and the e-Niro provides owners with a range of technologies to enhance battery efficiency and improve the car’s range. These include regenerative braking technology and an Eco Driving Assistant System (Eco DAS), which provides drivers with intelligent guidance on how to drive more efficiently. Eco DAS includes Coasting Guide Control (CGC) and Predictive Energy Control (PEC), enabling drivers to maximise vehicle range by suggesting when to coast or brake. A single ‘First Edition’ model will be offered in the UK that brings convenience features including rear parking sensors and a reversing camera system, electric windows all round, an auto-dimming rear view mirror and an engine stop/stop button with a Smart Entry System. Other equipment includes rain sensing windscreen wipers, automatic headlight control, electrically adjustable, automatic air conditioning and heated and folding door mirrors. Onboard features include wireless charging, 8.0-inch touchscreen HMI (human-machine interface) in the centre of the dashboard to access EV-specific info and a 7.0-inch colour-LCD driver instrument cluster which brings battery charge information on-the-move. Driver assistance systems include Kia Vehicle Stability Management (VSM) as standard. Other active safety systems available in the e-Niro include Forward Collision Warning with Forward Collision-Avoidance Assist (FCA+), Smart Cruise Control with Stop & Go (SCC+), High Beam Assist (HBA), Driver Attention Warning (DAW) and Lane Keep Assist System (LKAS). In-car entertainment includes a DAB radio and 8.0-inch touchscreen satellite navigation system with European mapping and Traffic Messaging Channel (TMC). In addition, Kia Connected Services includes TomTom Live that incorporates traffic, speed cameras, local search and weather updates. As well as Bluetooth with music streaming, the e-Niro includes Apple CarPlay and Android Auto with voice control. UK sales of the e-Niro start in April 2019 and it gets the same seven-year 100,000-mile warranty seen across the Kia range.